Finally! I have photos of Juno Regina! I started this back before I went to Europe. 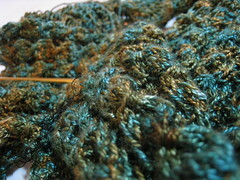 I got through the first lace section so I could just knit the miles and miles and miles of the straight middle. Ok maybe it wasn’t that long but it sure felt like it! It’s part of the reason it took so long. I don’t think I’ll ever knit lace again that has a straight section like that. But over all I love it. I should have made it a bit longer. How do you find a balance between work and the rest of your life? Especially when you love your job? It ain’t easy especially when you move to a new town, have a longer commute and join a gym. But you work on it, and I am. 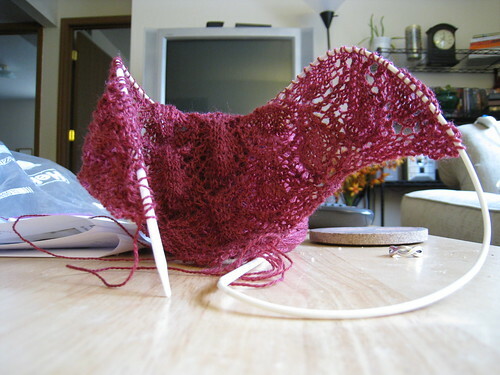 I’m still working on my Gossamer Stars Scarf – it’s delicate and beautiful, but it doesn’t take that great of pictures. I love the combination of this yarn and pattern. I’m SO close to finishing the Juno Regina Scarf, I’ve started the pattern for the end! I love this project! The yarn came to me by way of Skyline Chilly, my previous secret pal upstream partner. 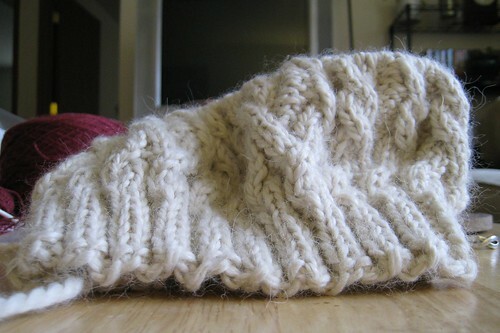 Guys I have lost my knitting and blogging mojo. I don’t know what it is but since I’ve been back from Italy I have almost no desire to knit, blog, read knitting blogs, whatever. I feel bad about this. I’ve rounded up my WiPs to blog about them in an effort to get my mojo back. But first! The contest! Contestant names were printed on strips of paper and put in a bowl. The knitting winners was Shannon & the non knitting winner was Jenster. Send me an email with your Snail mail addy and I’ll send off prizes soon. I think I’m gonna go to an out of town yarn shop to get prizes. Jenster – you too, for some reason Idon’t have your address. On to the knitting! Ok seriously remember my yarn diet? uh yeah, I’m ashamed to say I’m not doing well. 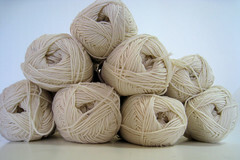 Granted I’ve curbed the impulse more often than not but there has been some yarn buying! I can’t help it! I seriously need someone to follow me around and kick me in the shins when I want to buy yarn. 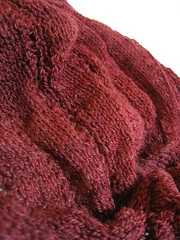 Juno Regina went to Italy with me and I knit on it quite a bit, but my focus was on Tuscany so I didn’t finish it. I’m getting close to the end though. Just need to actually work on it! 🙂 It’s beautiful and I know I’ll wear it a lot once it’s complete. The Lorna’s Laces is yummy! I can’t help but remember it arrived while I was staying in a hotel due to The Ice Storm From Hell and how happy it made me! 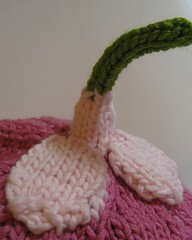 This is some secret knitting, it’s a gift. 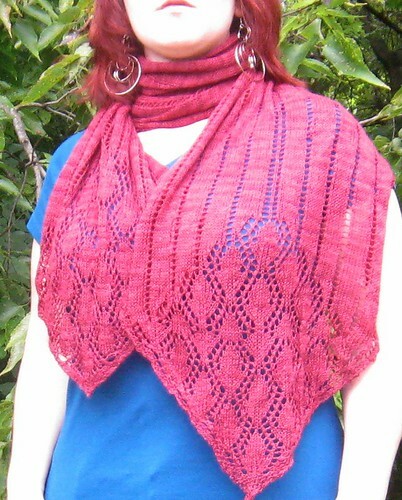 The Melon Pattern Scarf from Victorian Lace today. Remember it? From waaaaay back when. I love this yarn and the pattern and them together. So why haven’t I been working on it? I have no freaking idea. But I have picked it back up again. Originally I wasn’t going to add the border, but now I think I will, I have enough yarn and I’ve gained confidence in my lace knitting skills. 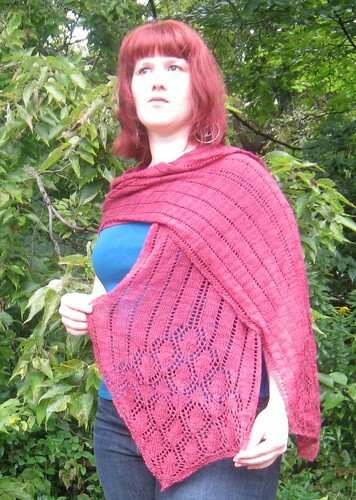 So I’m changing the name from Melon Pattern Scarf to Melon Pattern Shawl. Hopefully it will be big enough to be called a shawl! This isn’t really even a WiP, I picked up some recycled silk, did a simple knit-every-row-on-too-big-needles scarf and just need to weave in the ends. Er, yes I bought it recently, yes I know I’m on a yarn diet. It was a sale and it’s black it will go with everything! Ok fine, you’re right I shouldn’t have bought the yarn. 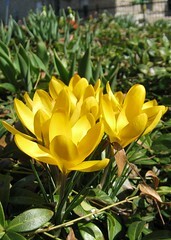 Ah these, Mitty Envy from Weezalana. 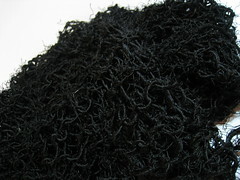 I bought this yarn because I loved the color and had no idea what to do with it, not being a sock knitter you know. Browsing my queue I came across Weeza’s pattern. Perfect they were made for each other. The pattern is great, but apparently I’m not. I’ve already frogged once and have to do so again because I can not read. I am a moron. 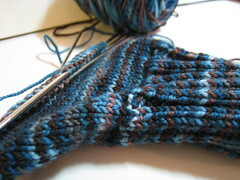 I should be done with both mitts at this point. Maybe I deserve to have my mojo missing. 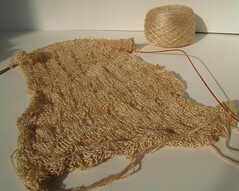 Not a WiP but soon to be, this yarn will be the Apres Surf Hoodie from the new issues of Interweave Knits. I’m just waiting on the needles to get here. I hope everyone else’s mojo is just fine. I’m off to try to get caught up on my blog reading! I’ve got to confess to you guys about something. I don’t spend a lot of time reading the Rav Forums, or the Knittyboard. When I do have some time I like to read blogs. I used to feel guilty about this,that I wasn’t spending enough time being part of the community, but I do read a lot of blogs and that’s part of the community too right? Well after reading some recent posts about the judginess going on in those place I am completely absolved of my guilt. That’s right, if that’s what’s doing down in those forums I’m glad I don’t hang out there. 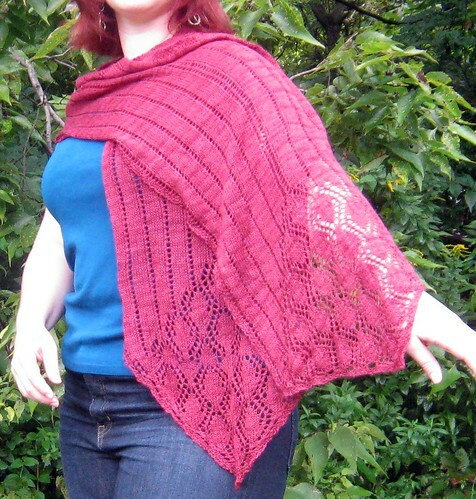 I love Ravelry because it lets me organize my knitting, my projects, my stash, my queue, and that it allows me to oh so easily see what others have made with that yarn or how that sweater looks and 50 different bodies rather than the carefully posed model so I can see how it looks on me. See the theme here? I use Ravely for ME. It is about me. There is nothing wrong with that. So if there are some people who think that my stash is about bragging rather than the damn fine organizational options of Rav, or that Yarn Pr0n Fridays is showing off instead of appreciation of some serious fiber goodness, or that my schedule of Wordless Wednesday and YPF are bad, well, frankly those people can piss off. I’ve seem some of the nicest bloggers I know fretting about this, and I seriously annoys me that these, super nice, friendly generous people are letting trolls get to them this way. So I’m making a statement here on my blog to those people (not to you, dear readers, I know you guys are awesome! ), cuz I guess I’m just not as nice as the bloggers that are worrying about it. I love YPF! Viva la Pr0n. If you can’t appreciate the yarn and instead get all bitter that I have it, go away. I don’t want you here anyway. If you think my Rav stash or anyone else’s is showing off, instead of using the fabulous tools that Rav provides, don’t be my friend. I don’t what your judgy, angry vibes anywhere my knitting anyway. I blog on a schedule cuz it works for me, do it your way on your blog, and I’ll do it mine on mine. Seriously. I don’t want pissy, bitter judgmental people reading my blog anyway. If I met them in person I probably wouldn’t like them and I don’t want people I don’t like reading my blog and being my blog friends. So there. I just can’t understand why people would complain about all of this so much in a public place. Just don’t read the blog and seriously don’t they have better things to do with their time, like knitting?